An array of live music is featured all three days of the festival. Shrimp is the co-star of the festival, but the menu is diverse - from trout to po-boy sandwiches and from lobster tail to gyros. 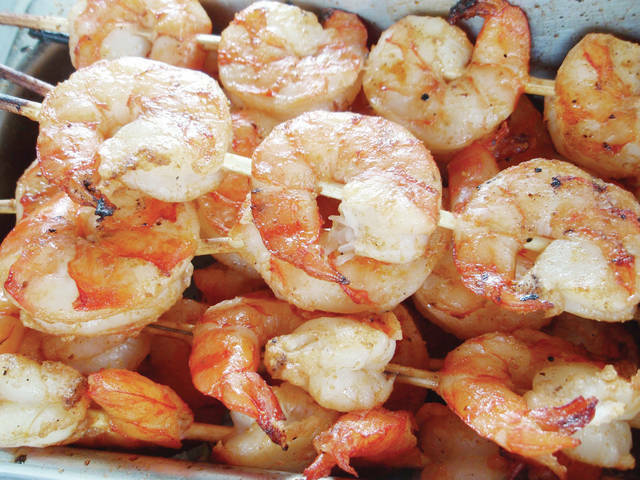 A crowd-pleasing recipe of fresh fish, shrimp and other delicious food, savored with three days of live music on an outdoor stage in the Ohio countryside, will return Sept. 21-23 at the 17th annual Ohio Fish and Shrimp Festival. The festival, a celebration of Ohio’s freshwater shrimp harvest, makes its home at Freshwater Farms of Ohio, 2624 N. U.S. 68, a mile north of Urbana. “We’ve again assembled a line-up of top-notch musical entertainment in a fun, affordable outdoor fall festival for the whole family,” said Dr. Dave Smith, president of Freshwater Farms of Ohio. Parking is free and gate admission ($5, age 13 and up; $2 for kids ages 3-12; and free for age 2 and under) provides access to the live music as well as the farm’s sturgeon petting zoo, fish and critter displays, bounce houses and kids’ play zone. The 11 bands performing at this year’s festival include five returning crowd favorites – alt-country rockers Angela Perley and the Howlin’ Moons, blues band Deuce ’n a Quarter, rock bands White Buffalo Woman and the Devil Doves, and blues singer Teeny Tucker. New to the stage this year will be Harper and the Midwest Kind, Mustard’s Retreat, Wolf Moon Revival, The Johnny O Project, Spikedrivers and David Mayfield Parade. Thirteen food and beverage vendors, including host Freshwater Farms of Ohio, will satisfy the appetites of festival guests with everything from trout that’s raised on the farm, to coconut crusted shrimp, lobster tail, crab cakes and crab legs, po’boy sandwiches, corndogs, chicken strips, hot dogs and brats, to gyros and Philly cheesesteaks, to sugar waffles and ice cream. For complete information about the Ohio Fish and Shrimp Festival, visit fwfarms.com/festival or the Ohio Fish and Shrimp Festival Facebook page. 4:30-6 p.m. – Deuce ’n a Quarter is a central Ohio blues band fronted by the strong voice and wailing harp of Brian Peters. Performing originals and classic covers, he’s backed by Steve Perakis on bass, Andre Scott on drums, guitarist Jeffrey Allen and John Sipher on keyboard. 6:30-8 p.m. – Harper and the Midwest Kind, led by award-winning Australian singer/songwriter Peter D. Harper, offers up a heady mix of roots music featuring his soulful voice, harmonica and the haunting drone of the didgeridoo, a wind instrument developed by Indigenous Australians. Harper’s latest CD, Show Your Love, hit #3 on the Billboard USA charts and stayed in the top ten for six months. 8:30-10 p.m. – Angela Perley & the Howlin’ Moons, repeatedly voted Columbus’ best band in the Columbus Alive magazine readers’ poll, are back for a sixth crowd-energizing performance. They blend classic rock, alt-country and psychedelic rock. The band is working on its third studio album, following up on Homemade Vision, which earned the #5 spot on PopDose’s Top Albums of 2016 list, and Hey Kid, with opening track, “Athens,” which won first place in the Americana category of the 2014 International Songwriting Competition. 11:30 a.m.-1 p.m. – The Devil Doves of Columbus have released their second album, Also Playing, and are taking their energetic rock performances across Ohio. Their music features the gruff, reflective lyrics of Junior Kauffman, Kyle “Headband” Davis on the cajon, Rev. Rico “Thunderstorm” Nassau on the bass, and the improvised keyboard work of Jeff Straw. 3:30-5 p.m. – White Buffalo Woman, based in the Canton area, fuses rock, blues, psychedelic, soul and punk into an explosion of new music. Their most recent self-titled CD/LP was released by Grimtale Records in early 2016. The band travels multiple states and has gained airplay on Little Steven’s “Underground Garage” on SiriusXM. 5:30-7:30 p.m. – Wolf Moon Revival is a newly formed blues band composed of some of Dayton’s finest blues musicians. Founder and bass player Bradley Denson is also founder of the Miami Valley Music Festival. Guitarist Eric Stephens has won contests such as the Cincy Blues Challenge and competed in the International Blues Challenge. Drummer Brandon Austin attended the Berklee College of Music and has toured throughout the U.S. and in several countries. Harmonica player and singer Joe Waters (with a previous festival band, Troubled Waters) has won the Columbus Blues Challenge two years in a row and competed as a semifinalist in the International Blues Challenge. 8-10 p.m. – Teeny Tucker, Dayton native and daughter of blues singer/songwriter Tommy (“Hi-Heel Sneakers”) Tucker, has developed a vocal style and career of her own, performing around the world and on the same bill with blues greats like B.B. King, KoKo Taylor, Etta James, Buddy Guy, Robert Cray, Keb Mo and the Holmes Brothers. In 2010, she was inducted into the Blues Hall of Fame and serves as the hall’s Ambassador to Ohio. Also in 2010, she was named Monterey Bay Blues Artist of the Year and was a 2014 nominee for Living Blues Magazine Artist of the Year and Blues Music Award Artist of the Year in 2014 and 2012. 11:30 a.m.-1 p.m. – The Johnny O Project will celebrate a homecoming for guitarist Johnny O, a former Urbana resident who performed widely in the area before making his move to Las Vegas. In Vegas he became known as one the city’s top professional musicians, performing at local clubs and on the Strip. In the Johnny O Project, now based in Port Clinton, Johnny is joined on stage by his son, Joshua Olalde, on bass guitar and his friend Paul Ochs on drums. The band puts its own creative stylings on popular tunes from the ‘70s through ‘90s. 1:30-3 p.m. – The Spikedrivers play bluesy, upbeat, country-fried rock ‘n’ roll, led by front man and songwriter Jesse Henry. The band, which has recorded four studio albums and three live records, began in late 2003 when Henry and Steven Fox met at an underground musician’s showcase in Columbus. They had just earned undergraduate degrees in jazz and classical music, and through their shared passion for American roots music, formed the Spikedrivers – joined by accomplished musicians Megan Palmer, Steve Sweney, Paul Brown and Nathan Anders. 3:30- 5 p.m. – David Mayfield Parade’s front man and namesake grew up playing bass with his family’s bluegrass band. He collected national awards for his guitar and mandolin playing and backed his sister Jessica Lea Mayfield’s band – including an appearance on “The Late Show with David Letterman.” And as a member of the bluegrass band Cadillac Sky he played sold out shows with British folk revivalists Mumford and Sons. He’s since become a singer-songwriter, band leader and Grammy-nominated producer. And with his own band, Mayfield has recorded three albums, his most recent, “STRANGERS,” which stretches from the avant-garde to his musical roots in bluegrass. When: Friday, Sept. 21, 4-10 p.m.
Saturday, Sept. 22, 11 a.m.-10 p.m.
Sunday, Sept. 23, 11 a.m.-5 p.m.
Daily admission: $5; ages 3-12, $2; and 2 and under, free. Admission provides access to live music, the sturgeon petting zoo, fish and critter displays, bounce houses and kid’s play zone. Free parking. For more information, visit fwfarms.com/festival. Shrimp is the co-star of the festival, but the menu is diverse – from trout to po-boy sandwiches and from lobster tail to gyros. Gary Schenkel is a regular contributor to this newspaper.